Newport firefighters helped make a dream come true for cancer patient Brayson Dunton on Saturday, making him a junior firefighter. Brayson Dunton wants to be a fireman when he grows up. 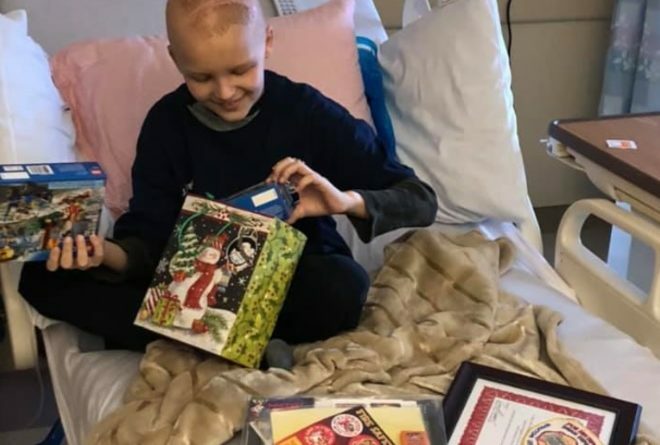 Thanks to the Newport Fire Department, his dream came true Saturday as the 9-year-old continues his fight against brain cancer. A group of firefighters went to Northern Light Eastern Maine Medical Center in Bangor to visit Brayson who was completing his latest round of chemotherapy after having a brain tumor removed. Patches can be sent to: Brayson Dunton, 46 South Main St., Detroit, ME 04929. Firefighters also brought Brayson presents and helped him on his way out of the hospital. “If you see him around, just remember he’s one of us!” the post ends.